↑ Trent Holden, Anna Metcalfe (2009). The Cities Book: A Journey Through the Best Cities in the World. Lonely Planet Publications. https://books.google.com/books?id=wGCGLEO-Vs8C&pg=PA36&dq=amman%27s+nickname&hl=ar&sa=X&ved=0CBoQ6AEwAGoVChMI-MutgZGiyAIVyWsUCh22AQRZ#v=onepage&q=amman's%20nickname&f=false. अन्तिम पहुँच तिथि: 2015-10-01. ↑ "अम्मानको स्ट्रीट खाद्य". BeAmman.com (BeAmman.com). Archived from the original on 2015-09-26. https://web.archive.org/web/20150926043908/http://beamman.com/food-/175-amman-street-food. अन्तिम पहुँच तिथि: 2015-09-26. ↑ "Population stands at around 9.5 million, including 2.9 million guests". The Jordan Times (The Jordan News). 2016-01-22. http://www.jordantimes.com/news/local/population-stands-around-95-million-including-29-million-guests. अन्तिम पहुँच तिथि: 2016-01-22. ↑ "Number of tourists dropped by 14% in 2013 — official report". 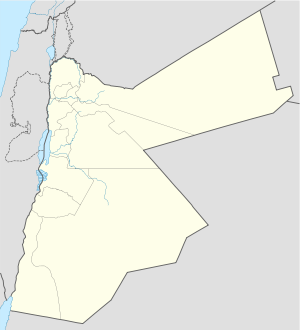 The Jordan Times (The Jordan News). 2014-02-08. http://www.jordantimes.com/news/local/number-tourists-dropped-14-2013-%E2%80%94-official-report. अन्तिम पहुँच तिथि: 2015-09-21. ↑ ७.० ७.१ ७.२ Michael Dumper; Bruce E. Stanley (2007). Cities of the Middle East and North Africa: A Historical Encyclopedia. ABC-CLIO. https://books.google.com/books?id=3SapTk5iGDkC&pg=PA35&dq=east+and+west+amman&hl=ar&sa=X&ved=0CCIQ6AEwAWoVChMIpd7d0supyAIVQUMaCh2oUwPF#v=onepage&q=east%20and%20west%20amman&f=false. अन्तिम पहुँच तिथि: 2015-10-04. ↑ "Aqel Biltaji appointed as Amman mayor". The Jordan Times (The Jordan News). 2013-09-08. http://www.jordantimes.com/news/local/aqel-biltaji-appointed-amman-mayor. अन्तिम पहुँच तिथि: 2015-09-21. ↑ IANS/WAM (2010-11-26). "Abu Dhab duke City' in MENA region". sify news. http://sify.com/news/abu-dhabi-voted-best-city-in-mena-region-news-international-kl0wuhjcbdc.html. अन्तिम पहुँच तिथि: 2015-09-22.